In 2004, MYR Group entered into the Electrical Transmission & Distribution (ET&D) Strategic Partnership agreement with the Occupational Safety and Health Administration (OSHA), six other electrical contractors, and the IBEW, NECA and EEI. The primary objective of the Partnership is improving worker safety in the high-voltage electric line construction industry. To date, growth of Partnership member organizations has nearly doubled, and the Partnership agreement with OSHA was renewed and expanded consecutively in 2006, 2008, 2011 and most recently, in December of 2013, so partners can continue to work on common goals that reduce partner injury, illness and fatality rates. Today, the ET&D Strategic Partnership is one of only a few national partnerships between employers and the federal job safety agency, and covers an estimated 80 percent of total workers in the line construction industry. Main goals of the Partnership include thorough data analysis to establish causes of fatalities, injuries and illnesses, development and implementation of industry best practices, development and delivery of specific training courses and establishment of effective communication to promote the value and importance of occupational safety and health. As a member of the Partnership, MYR Group is actively involved in several different safety and health outreach and promotion activities. 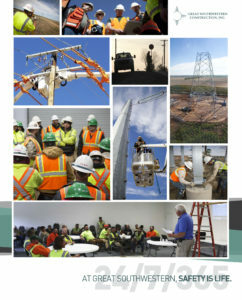 These include the development of best practices training programs, contributing information and content to the Partnership’s website www.powerlinesafety.org, presenting at major safety conferences and conducting safety stand-downs. Specific partnership accomplishments include the implementation of an OSHA-approved ET&D 10-hour training program for electrical power employees and the ET&D 20-hour supervisory leadership program. The 20-hour program emphasizes supervisor and management knowledge and skills development as well as the importance of management involvement and support to maintain an effective safety program. Since its inception in 2004, there has been a noticeable reduction in the injury, illness and fatality rates among the partners’ workers, which include close to 26,000 employees. GSWC is a subsidiary of MYR Group. Sign up to receive all MYR Group company news. As a founding member of the ET&D Partnership, MYR Group has developed a video training series for employees on the ET&D best practices. At Great Southwestern, Safety is Life. It sustains our employees, customers and company, and is a core value.